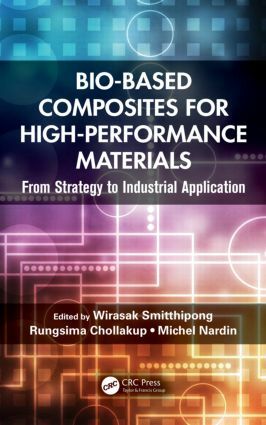 "This book provides an overview of the state of the art and emerging trends in the area of bio-based composites, demonstrating the existence of a lot of solutions, and underscoring the idea that their applications require interdisciplinary understanding, particularly in the fields of materials science and engineering." Wirasak Smitthipong is a researcher at the Agricultural and Agro-Industrial Product Improvement Institute in Kasetsart University, Thailand. Heearned his PhD in chemistry from the University of Haute Alsace, France. Dr. Smitthipong was awarded a National Science Foundation postdoctoral fellowship at the Materials Research Laboratory and College of Engineering in the University of California, Santa Barbara. He worked for Michelin as a lead rubber formulation designer in France and Thailand. His research interests include surface and interface phenomena, rubber, adhesion, composite materials, biomaterials, polymer science and engineering, and supramolecular and nanoscale materials. Dr. Smitthipong has authored or co-authored more than 60 scientific articles and papers and edited two books. Rungsima Chollakup is asenior researcher at the Agricultural and Agro-Industrial Product Improvement Institute in Kasetsart University, Thailand. She earned her PhD program in textile science at the University of Haute Alsace in Mulhouse, France. She pursued postdoctoral studies at College of Engineering in the University of California, Santa Barbara and was a visiting researcher at the Laboratoire de Photochimie Moléculaire et Macromoléculaire in the Université Blaise Pascal, France. Her research interests include natural fibers, polymer characterizations, composite materials, and biomaterials. Dr. Chollakup has authored more than 50 scientific articles and papers and three book chapters. Michel Nardin is the former director of researchof the French National Center for Scientific Research. He earned his PhD in physical chemistry from the Universities of Strasbourg and Mulhouse in France and then pursued postdoctoral studies at University of Leeds, UK. His research interests include the fundamental and practical aspects of adhesion, physical chemistry of surfaces and interfaces, wettability, capillary impregnation of powders and fabrics, thermodynamics and micromechanics of fiber–matrix interfaces in composite materials, tack and adhesive properties of elastomers, interactions of surfaces, and living matter. Dr. Nardin has authored more than 170 scientific articles and papers as well as 11 book chapters.